The New Orlean Saints are just a great story all around. Not only did they win their first ever Super Bowl last night, beating the Indianapolis Colts 31-17, but the Saints also beat the Colts in popularity on Google search (see chart below). Of course, as we got closer to game day, search volume started to increase. 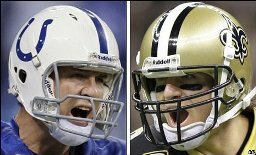 And the volume of search remained consistent for both the Saints and the Colts.